Molded Fiber Glass Tray Company (MFG Tray Co.) partnered with a pharmaceutical manufacturing industry leader to design a customized vial tray to fit a specific production application. Engineering departments collaborated to generate MFG Tray Co.’s NEW vial tray model 236008 Series which compliments the company’s existing line of vial trays. The new vial tray series is comprised of two parts: model 236008, a 3-sided tray (14.9”L x 9.125”W x 3”H) with several different gate options to fit the customers’ needs and model 236118, a vial tray extension lid (15.2”L x 9.125”W x 1.5”H). 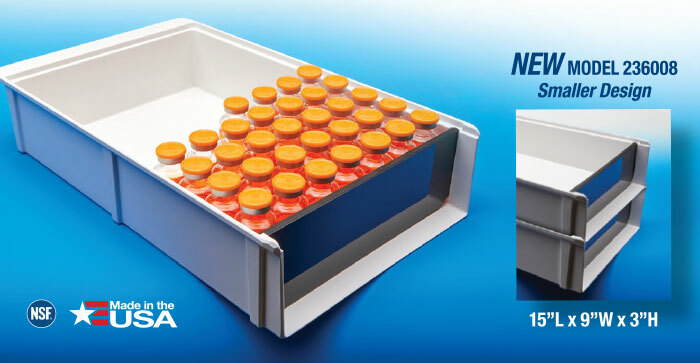 The NEW model 236008 vial tray is smaller in design and built to increase productivity and efficiency. The NEW model 236118 vial tray extension lid is designed to be used for vials ranging in height up to 3.8” to enable the stacking function to save valuable work space. MFG Tray Co. pharmaceutical vial trays serve an array of handling and storage needs in pharmaceutical processing. They are manufactured to withstand automated handing and are constructed from autoclave, ETO, lypophilization and gamma sterilization safe material. They are an economical alternative to metal trays and containers. Composites are specifically designed so they won’t corrode, dent or bend like metal. Unlike disposable plastic trays, their strength and durability ensure years of value-added service. The vial trays feature a smooth surface with a tapered front lip for easier loading and unloading and are easy to clean in standard washers. MFG Tray Co. pharmaceutical vial trays may be continuously used in temperatures from -60° to 250° F (-51° to 121° C), and special formulations are available for temperatures between 300° and 400° F.
MFG Tray Co. composite trays and containers are safe for pharmaceutical processing. All materials used in the construction of MFG Tray products are listed in the NSF Standard No. 2 and in USFDA Code of Federal Regulations, Title 21, of the Federal Register, Section 177.2420. MFG Tray Co. strongly believes in helping you find solutions. When you need that special solution, whether it is a sample tray or a custom part, please contact the Pharmaceutical Product Line Manager, Anthony Cicero at acicero@mfgtray.com or 1-800-458-6050. The Molded Fiber Glass Tray Company (MFG Tray Co.) was founded in 1952 in Linesville, Pennsylvania, and are pioneers in the material handling industry. We, like other divisions of Molded Fiber Glass Companies, have found great success applying the unique properties of reinforced composites to solve problems in various industries. We manufacture reinforced handling of goods.